First, color. Always, always color is close to my heart. My Bright + Shady cross quilt was named after my most recent mosaic contest. My mosaic contests are always inspired by the colors I’m currently craving. At the turn of the new year, I needed something exuberantly bright. A dash of black fabrics emphasizes those bright colors. Next, scraps. This quilt was made all of scraps, except for a few fat quarters I selected for the 12” finished blocks. 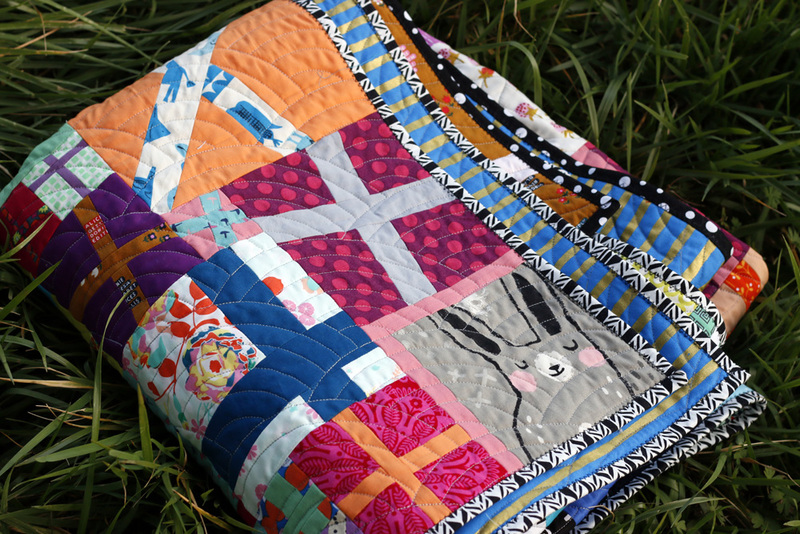 Scrap quilts are always satisfying, but this one was particularly so. That’s because it efficiently used scraps of all sizes: squares, chunks, strips and crumbs. Awesome! And then there was character! Along the way I noticed that I was using many fabrics with cute motifs: strawberries, seals, sunglasses and fish. Many of these were by Cotton & Steel. I decided to continue the theme by making room for some large scraps by Sarah Watts from her Sleep Tight collection. These scraps were large motifs that would not be served by slicing and dicing, so I included them whole. Random rabbits, bears and grumpy stars? Definitely fun! Of course, I also enjoyed that these blocks were improv-pieced (tutorial here!) and then improv-assembled. This project managed to combine a sense of carefree relaxation and the challenge of puzzling the patchwork together. I so enjoyed making a quilt based on magic numbers! It’s something I’ll have to do again soon. Save with Intro Pricing on a new collection of stripy blenders. French Press by Kathy Hall for Andover Fabrics is available in a rainbow of hues at Pineapple Fabrics. Now through February 12th! When it came time for the backing, I treated myself to a special fabric from Quilt Sandwich. This is a bee print by Melody Miller that’s a great scale for quilt backs. The bees are made up of pixelated hearts - so unique! How lucky that Quilt Sandwich still has it. To carry the bright and playful theme to the quilt back, I combined the bee print with this Cheshire stripe by Rifle Paper Company. I know it doesn’t actually match, but that’s the point. It’s fun and funky - just like the quilt top. I feel like this is getting long, but I really enjoyed making this quilt! I quilted it with Baptist fan, which has a 60’s vibe in my mind. It adds a soft, regularity to this work. There’s a photo of it stretched on my longarm here on Instagram. Sometimes I post sneak peaks there! The quilt is bound in black and white prints, for a shady frame. I’ve decided to hang onto this quilt as a sample. I so enjoyed making it that I’m thinking it would be fantastic as a workshop someday. We’d make improv blocks using magic numbers for patchwork and practice joining them with partial seams. I don’t know when or how, but it seems like saving the quilt is the first step. Thanks for enjoying it with me!